Adobe’s February Lightroom release brings updates and enhancements across its whole photography ecosystem, but it’s the new Enhance Details feature that’s likely to attract most interest. 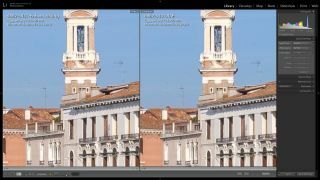 It uses Adobe’s Sensei artificial intelligence technology, machine learning and computational photography to increase the resolution of fine detail in raw files by up to 30%. Adobe says it’s a brand new approach to demosaicing raw photos that works on regular Bayer sensors, as used by most cameras, and the X-Trans sensors that feature in Fujifilm cameras. Demosaicing is the process where the data captured by the red, green and blue photosites on the camera sensor are merged and ‘developed’ into full-colour images. The new option creates an 'enhanced' DNG file alongside your original image. Adobe says the update will also address issues reported with X-Trans raw files by some customers, as well as improving the rendition of fine detail and fine colours. In our brief tests so far its effect looks pretty subtle, but it's likely the outcome will depend upon the subject matter. The Enhance Details feature has been added to Adobe Camera Raw, Lightroom Classic CC and Lightroom CC, but there are other changes too. Adobe's February update adds support for three new cameras: The Nikon Coolpix A1000 long-zoom compact, the new Olympus OM-D E-M1X pro sports camera and Sony’s new mirrorless A6400 – though support for this camera is preliminary, which means Adobe will refine the processing and add full support at a later date. Adobe has also introduced automatic lens profiles for the new Nikon AF-S NIKKOR 500mm f/5.6E PF ED VR super-telephoto lens, including additional profiles for when this lens is used with Nikon’s 1.4x, 1.7x and 2.0x teleconverters. Adobe has split Lightroom into two products. Lightroom CC Classic CC is the regular desktop version, while the newer Lightroom CC is for use with photos stored online via Adobe’s Creative Cloud service. Until now, Lightroom CC has lagged behind the desktop version in features, but takes a step closer now with the introduction of the HDR, Panorama and HDR Pano tools already available in the desktop version. A new Targeted Adjustment Tool makes it easier to carry out colour and tonal adjustments in Lightroom CC. Lightroom CC also gets histogram 'clipping' alerts to warn you of blown highlights or blocked-in shadows. Lightroom CC also gets a Targeted Adjustment Tool and Histogram clipping indicators. It doesn’t yet match the full power of Lightroom Classic CC, but it’s getting closer. Elsewhere, Lightroom CC for iOS (Lightroom mobile) now has the ability to create ‘ad hoc’ photo shares, and Adobe has made changes behind the scenes ahead of “exciting” new features yet to come. Lightroom CC for Android and ChromeOS owners have to settle similar behind-the-scenes improvements and bug fixes, while Lightroom Classic CC users get improvement tethered shooting performance with Nikon cameras.